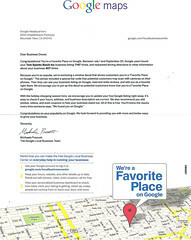 In this letter Larry Page , Sergey Brin and Michaela Prescott informed me that we're a favorite place on Google. I'm like cool! But, what the heck did I do? I had gone into my maps page and filled out everything I could after setting in one of Brian Pasch's Webinar's, and that was almost 2 years ago. In the letter I recieved Google gave me a “Door Sticker” that has a new style bar code. Why does Google want me to put this on my door? I DON'T KNOW, BUT I'M DOING IT! According to Google, What's that bar code? Leave a review right after you leave the business. What's a better time to write what you think, than when you've just visited? Google is also developing picture search. Snap a picture on your smart phone, send to Google and it will result in a SERP (search engine results page). I recently watched Inside The Mind of Google on CNBC for a rare look at the world's most powerful technology company and its crown jewel, the Google Internet Search Engine. You can watch it on Hulu just Click Here. Google has rolled back the picture search product launch, but its coming soon to a smart phone near you. If they are sending mail to support the QR code for smart-phones, you had better have your Google Assets tweaked, peaked and sleek! How should you get started? Here's some great info from one of Brian Pasch's informational sites. Google Maps is one of the building blocks for an online marketing presence. 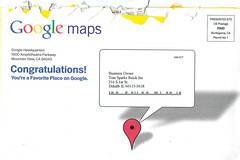 Google Maps is free and every business owner should make sure that their brand is registered on Google Maps. 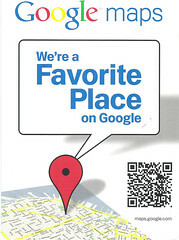 Have you checked your Google Maps listing? Google Maps is often displayed when a consumer types in a town name or state name with a search phrase. This means that Google Maps is a great place to attract new customers who may not be familiar with the local shops and businesses. 1. Create a Google account. It's free and simple. 2. Login to your Google account. 3. Search your business name in Google Maps. 4. If your business is listed, "claim the business" listing that is shown on the map. Once the listing is part of your account, update all information that is requested on the listing and submit the changes. This may require you to validate your changes via a phone call or via postal mail. Choose the best option that fits your needs. If you have an automated voice mail attendant on your business line, the phone verification will not work. If you choose a postcard, wait 7-10 business days to get your card. Once you have your card you can log back into your Google account and input the PIN number shown on the postcard. This will activate your Google Maps listing. 5. If your business is not listed, add your business listing. Enter all the information requested and then verify your listing via phone or postal mail. 1. Make sure you enter a valid phone number since the phone number is what consumers will see on the maps listing. Do not use a salesman's cell phone number or any phone number that will not be handled consistently. 2. Make sure you verify your listing. If the postcard does not arrive, request another postcard and make sure you inform the mail room NOT to throw out 3x5 postcards from Google. 3. A proper Google Maps listing can be leveraged in your Google Adwords campaign so make sure it is active. 4. According to some SEO experts, Google Maps can be a leading source for traffic to your website. If you think your behind on GPOM (Google Page One Management) this is the first place to start. Why? Our customers are no longer using a phone book or reading a map. They are typing words into the little white box of the “Digital God” Google. So we need to play the “Google Match Game”. We need Digital Assets that align with the words consumers are putting into the Google Box. Now I know most of us know this but, my question is this, what Digital Foot print have you left this week? There are more FREE assets on-line than there are vendors providing assets! I think we need a strategy for both. Vendors helping us obtain our wants and business goals with some old fashioned elbow grease on our part. This is how to leave a digital foot print, now go do it! I have special offer for you! Call me and I can help you with the registration process. 815-739-6054. If you call Carrie Valentine, registration coordinator, at 732-450-8200. When you use my name "Tim Jennings" registration will be reduced by $100. Coupon Code: Tim Jennings "The Internet Guy"
When our dealer Rater Reviews started pulling to Google It increased our map print outs and views in our market. Yep - facebook.com/ryanbolz - Matt actually was one of my first professional connections when I entered the auto industry fresh out of college. We've tweaked both our DealerRater profile and our google maps listing every which way and it's decidedly something on Google's end with how they are indexing us. Everything on our Google Maps and Local Listings page is in order - current info, pics and video, occasional coupons but none presently, and our reviews are feeding from the various sites across the web. One thing that you might have some advice on: Do you know of any way for the reviews to be indexed more frequently? For example, we have nearly 100 DealerRater reviews and Google only pulled about 15 of them... thoughts? Ryan do you have videos, pictures, coupons, basically all the blanks filled in on your Google maps page? I know one thing Google is my bedfellow. I stop look and listen every time I see Google Whatever! Keep up the good “extra work” That's what keeps us ahead of the competition. Ah, we got one of those too! From what I've been told Google has been tweaking Google Maps and the Google Local Business Directory and in some cases significantly changed how you were ranked in the local listings. Those companies that gained ground for being significantly (to whatever algorithm Google uses) more relevant within a users search got sent these cards in part as a congratulations, but I have no doubt to also generate buzz and draw attention to the various upgrades to local listings. Yelp also sends out stickers and a nice letter when you become a top rated business for your category. What shocks me is... if all these SEO gurus out there were as great as they say, wouldn't every single SEO/SEM company have gotten one in the mail first? I was a bit taken back when I saw it. I wondering who and how many they sent out. If you get the chance click on the Hulu link. Good show 45 min in length..
Congratulations, Tim. You obviously are doing something right to have Google personally pay attention to your store. Keep up the great work and thanks for giving all dealers something to strive for. See you in Orlando.